Congratulations to Yat Tse and Jackie Moore! You are invited to a behind-the-scenes look at our world-class educational anatomy facility to learn how health professionals and other students learn about the structures of the human body. Dean Richard Reznick is pleased to announce that Benoit-Antoine, Provost and Vice-Principal (Academic) at Queen’s University, has appointed Louise M. Winn as Associate Dean, Life Sciences and Biochemistry, Faculty of Health and Sciences, for a five-year period beginning in July 1, 2018. Congratulations to Dr. Anne Croy, one of three Queen’s University professors who were granted the honour today of being elected to the Royal Society of Canada (RSC), one of the highest honours for Canadian academics in the arts, humanities, social sciences, and natural sciences. Congratulations to Dr. Louise Winn! Congratulations to Dr. Cynthia Pruss, who won the Post Doctoral Fellow Award for Outstanding Oral Presentation for a second consecutive time at the Canadian Hypertension Congress in Montreal (October 19-21, 2016). Congratulations to Dr. Madhuri Koti! Allison recently defended her PhD in Dr. Anne Croy's Lab, and her recent work is featured on the cover of the October 2016 issue of the Journal of Leukocyte Biology! Congratulations Allison! Congratulations to Kaitlyn Tresidder, MSc candidate with Dr. Nader Ghasemlou. Kaitlyn was the recipient of the 2016 Canadian Pain Society 2016 Trainee Research Award for her project "The Chronobiology of Pain"! Bachelor of Health Sciences (Honours) Program Launch September 2016! The Faculty of Health Sciences is pleased to announce the launch of the new Bachelor of Health Sciences (Honours) degree program in September 2016. This degree program may be completed on a part-time or full-time basis and offers a significant amount of customization. Students choose from a variety of strategically designed courses, many of which have been created specifically for the program. Further specialization is encouraged through a series of unique learning tracks allowing for more in-depth study in specific fields of interest. The curriculum has been designed to develop students’ competencies and skillsets in relation to careers across the health professions. These competencies have been endorsed by healthcare professional schools and have been integrated into the program so that individuals have the credentials to pursue further education in the health professions or graduate studies. The online environment engages learners with purposeful assignments, requiring students to apply knowledge learned within courses and modules with real world applicability. In addition, a full range of support services is available to ensure student success. Congratulations to Kasra Khalaj, PhD Candidate in Dr. Chandra Tayade's lab, recipient of this year's Society for Reproductive Investigation's Best New Investigator Poster Award! His poster was titled Altered ZFP36/ELAVL1 levels in endometriosis. Congratulations to Christina Lamparter a PhD in the Department who was awarded the 2016 Peer Leadership Award. This award is given to a Queen’s student who has exemplified excellence in peer-to-peer assistance and outreach. Congratulatoins Dr. Anne Croy one of 5 recipients of this years university's Prize for Excellence in Research. Please see the link below for the article in the Queen's Gazette. Five Queen's University professors elected as fellows to the Royal Society of Canada. Principal Daniel Woolf is pleased to announce that Qingling Duan and Keren Zaiontz are the newest Queen’s National Scholars (QNS). Trained in Electrical Engineering during his undergraduate degree, Dr. Ken Rose was subsequently “bitten by the neuroscience bug”, in his words. He now has what he describes as a privilege of passing along his knowledge to undergraduate students in Life Sciences. When attempting to qualify the secret to his success, Dr. Rose explains that it’s not the what, but the how that’s important to teach. In a discipline often crowded with fact memorization, Dr. Rose has found a passion for doing things differently. Two years ago, Dr. Rose decided to create his own essay-style exam in a course where all other sections were doing multiple choice. Dr. Rose likes using experiments as teaching tools wherever it is feasible. Dr. Rose’s infectious energy and unwavering dedication to his students has made him very popular within his classes. It is no coincidence that in the middle of the interview for this article, a student came into his office, visiting him years after having graduated, to say hello and give him a big hug. “You do this because you care”, he says. When asked what this award means to him, Dr. Rose explained that it reaffirms his faith in changing the way that science education is delivered. “It says do it again, it’s working”, he says. He hopes that it might serve as an impetus for others who might be hesitant to try something new. Dr. Rose has a deep personal connection to an award that recognizes excellence in his life’s work, and would like to thank all who spent time nominating him. Congratulations Robyn Millott, recipient of the 2015-2016 CFUW Memorial Fellowship! Cancer is among the leading causes of death worldwide. Many successful therapies have been developed to fight cancer; however, cancer cells can become resistant to these therapies. Bioflavonoids are naturally occurring compounds abundant in fruits and vegetables, which are believed to have many health benefits. Robyn's research involves the study of bioflavonoids that cause cell death in cancer cells that are resistant to chemotherapy. The goal of her research project is to identify the specific interaction between bioflavonoids and a particular protein that has been implicated in promoting resistance to chemotherapy. This will give insight into the mechanisms of resistance, and hopefully lead to more effective treatments against drug resistant cancers. Congratulations to Nicolle Dominik and Paulina Brzezinska! Congratulations to Nicolle Dominik and Paulina Brzezinska for winning Silver medals at the CIHR Poster Competition at the Canadian Student Health Research Forum held June 2-4 in Winnipeg! The title of Nicolle’s poster was: ‘Murine Pulmonary Slowly-Adapting Receptors (SARs): Putative links to Neuroepithelial Body (NEB) hypoxia chemoreception and the Calcium Sensing Receptor (CaSR)’ and the title of Paulina’s poster was ‘Actin-based Structures in Migrating Arterial Myocytes are Dynamically Regulated by cAMP Phosphodiesterases’. Please join me in congratulating Dr. Ken Rose on being recognized for his outstanding contributions to teaching. Dr. Rose is one of two recipients of this year’s Frank Knox Award from the Alma Mater Society of Queen's University. This award honours two professors who have demonstrated an outstanding commitment to the education of students of Queen's University through their teaching excellence. The award is the highest honour which is given to instructors of Queen's by Students. This award serves as a reminder to all of the necessity for the strong commitment which professors must contribute through the high quality of their teaching to the students of Queen's. Dr. Rose is also the recipient of this year’s Faculty of Health Sciences Education Award. This award was established to recognize excellence in a range of teaching methods (small group, seminar, one on one supervision, lecture etc), course or curriculum design, course organization, development of learning resources education technology, evaluation and innovation. The winner has demonstrated excellence in teaching, a new or innovative approach, informed by external sources e.g. literature, and evidence of an impact on student learning. In making their selection the Committee will place emphasis on innovative approaches in education and ensuring that the teaching method or innovation is clearly linked to research studies and literature concerning the methods and activities of teaching. David Langelaan, postdoctoral fellow in Dr. Steven Smith's lab, was recently awarded Best Contributed Talk in the Symposium on Solution NMR: Biomolecular Structure, Dynamics and Function at the 98th Canadian Chemistry Conference and Exhibition in Ottawa, ON for his seminar entitled "Investigating the mechanisms of E2A-PBX1 based induction of acute lymphoblastic leukemia". Congratulations David! Congratulations to Carly Petes for winning third place in the poster competition at the Canadian Society for Immunology Meeting held June 4-7 in Winnipeg! Congratulations to Nicolle Domnik, PhD Candidate in Dr. John Fisher’s lab, for placing 2nd in the 3 minute Thesis Competition held by the School of Graduate Studies!! Congratulations to Dr. Andrew Craig, recipient of an innovation grant from the Canadian Cancer Society! The Faculty of Health Sciences is hosting the Graduate Studies Open House on Wednesday, January 21st from 11:00am - 1:30pm in Botterell Hall, Room 568. Congratulations to Christina Lamparter and Elizabeth Lightbody! Congratulations to Christina Lamparter (Winn lab) and Elizabeth Lightbody (Nicol lab) for winning the Intertek Student Research Award for best PhD and MSc Poster Presentation respectively at the recent Annual Meeting of the Society of Toxicology of Canada. Congratulations to Dr. Glenville Jones, he has been awarded the 2014 Queen’s University Prize for Excellence in Research. The Prize celebrates major research contributions undertaken at Queen’s and rewards research excellence. Dr. Jones will be presented with the award during Convocation on Wednesday, November 19th at 10am in Grant Hall. Queen’s University researcher Richard Oko and his co-investigators have come up with a promising method of treating male infertility using a synthetic version of the sperm-originated protein known as PAWP. They found this protein is sufficient and required to initiate the fertilization process. Dr. Oko’s research promises to diagnose and treat cases of male factor infertility where a patient’s sperm is unable to initiate or induce activation of the egg to form an early embryo. over 1000 posters. Congratulations to Chelsy for winning the award in this major international conference! Congratulations Zongchao Jia and Terence Ozolinš, for their individual awards from Ministry of Research and Innovation for their Leaders Opportunity Fund Projects. Congratulations also to Doug Munoz for his award from Ministry of Research and Innovation for his Leading Edge Fund Project. Reflecting their excellent contributions and achievements, Dr. Chandra Tayade and Dr. Gunnar Blohm have been awarded tenure and promoted to Associate Professor, Dr. Maha Othman has been promoted to Associate Professor, and Dr. Neil Magoski has been promoted to Full Professor effective July 1, 2014. Congratulations! Dr. Poole is this year’s recipient of the CSM Murray Award for Career Achievement. Sponsored by NRC Research Press, publishers of the Canadian Journal of Microbiology, the Murray Award is the Society's premier award for senior researchers. According to the Society, the intent of this award is to provide national recognition to outstanding Canadian microbiologists and to maintain a historical record of the achievements of these key contributors to microbiological research. 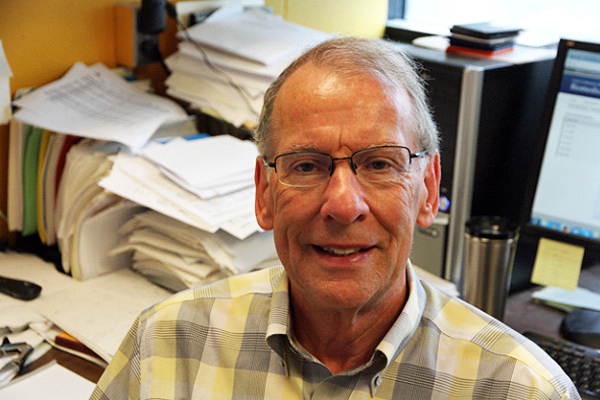 Dr. Poole will receive his award at the CSM Annual General Meeting being held in Montreal this July where he will deliver a talk on antibiotic resistance, the focus of his research for the past 20 years. After spending much of his career conducting extensive research on vitamin D metabolism, Queen’s researcher Dr. Glenville Jones has been featured in the Canadian Institutes of Health Research’s (CIHR) “celebrating the impact of health research” series. Findings from an international study led by two Queen’s researchers could lead to safer food sources and provide better protection for crops. Research emerging from the labs of David Zechel (Chemistry) and Zongchao Jia (Biomedical and Molecular Sciences) has revealed the secrets of a new enzyme, PhnZ, that can degrade phosphonates, a class of compounds that includes various herbicides. This finding may lead to a new way to remove these compounds from the environment. “Our research has revealed the molecular details behind the powerful reaction catalyzed by PhnZ. This sets the stage to engineer PhnZ to destroy compounds of concern, including herbicides on our major crops,” says Dr. Zechel. Genetically modified plants currently resist herbicides used to control insects and weeds. With the discovery of PhnZ, the enzyme could be added to crops that, when sprayed with herbicides, would neutralize the herbicide, making it safe for human consumption. The enzyme PhnZ was originally discovered a few years ago by a research team from MIT. The group’s research is funded by the Natural Sciences and Engineering Research Council and the Canadian Institutes for Health Research; it was recently published in the Proceedings of the National Academy of Sciences. Anne Tobin receives Special Recognition Award! Congratulations to Anne Tobin who received a Queen's University Special Recognition Award at the Principal's Reception on Tuesday, December 10th. Please join me in congratulating her on this impressive accomplishment which recognizes her outstanding contributions to Queen’s. We are very fortunate to have Anne as part of our staff complement. Michael Adams. Stephen Vanner and Alan Lomax (School of Medicine) have been awarded $370,000 from the Crohn’s and Colitis Foundation of Canada to help them and their colleagues continue their cutting edge research in this often debilitating illness. Dr. Vanner is the director of the Gastrointestinal Diseases Research Unit at Queen’s University and Kingston General Hospital and a leading researcher in inflammatory bowel disease (IBD). The abdominal pain is associated with IBD is often a debilitating symptom for patients and can result in emotional suffering and physical disability. The pain can be difficult to treat because the underlying cause is often unknown. Drs. Vanner and Lomax’s study not only examines what factors can decrease pain, but also how, in certain situations, these same factors can worsen pain. This knowledge can help doctors in understanding the pain mechanisms in IBD and guide them through treatment options. “We are very grateful to the CCFC for providing this opportunity to pursue these important questions and we are dedicated to making a difference in the lives of IBD patients,” adds Dr. Vanner. The MOOT XXVI NMR Symposium will be held over the October 25th weekend in the new medical school building. More information can be obtained on our website, www.mootnmr.org. Congratulations to Dr. Shetuan Zhang for his success in the recent Career Investigator Award competition with the Heart and Stroke Foundation of Ontario. Dr. Zhang also received a stellar rating in a very difficult competition for his project entitled "Molecular Mechanisms of Ion Channel Function in Heart Health and Disease".